What are comics? How do we tell stories using words and images? How can we effectively use the comics medium? 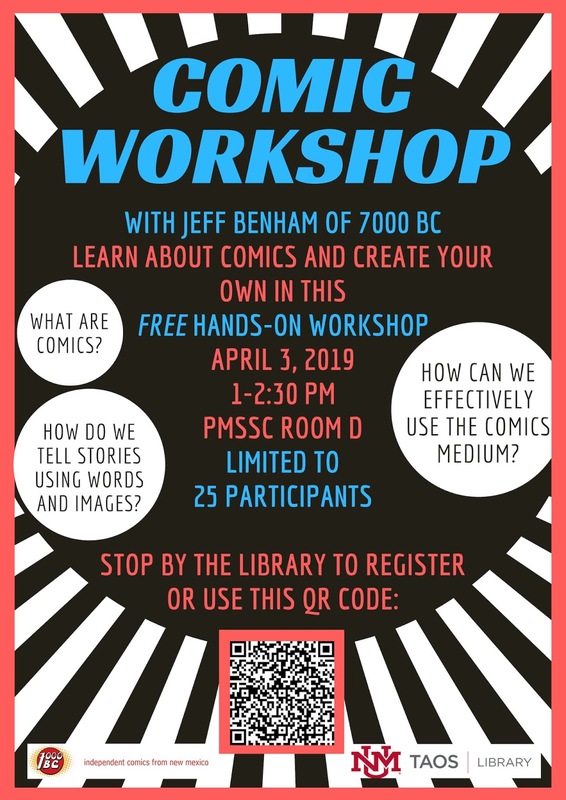 Learn about comics and create your own in this free, hands-on workshop. Limited to 25 participants, visit or contact the Library to reserve your space. Photos have been posted by the UNM Taos Library here. And following the workshop, Mike and Robin of KCEI Radio in Taos interviewed 7000 BC's Jeff and UNM Taos Library's Nicole. 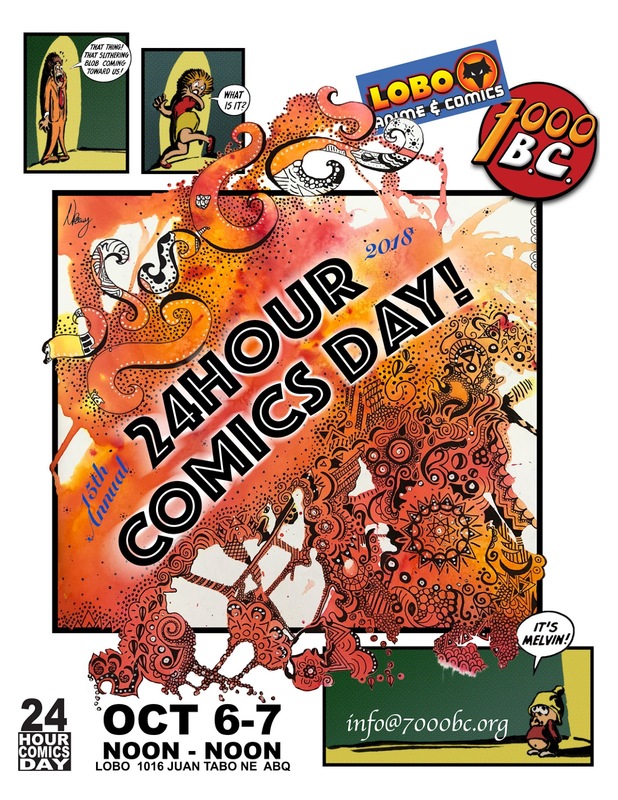 To hear the full program ("All About Comics") scroll down to the April 2019 Archives. 7000 BC will have a table at this year's New Mexico Library Association Conference. 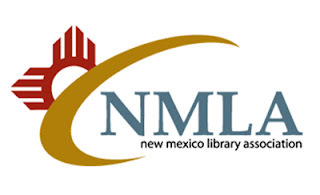 The conference brings together librarians from around the state, as well as several New Mexico based publishers and other vendors for three days of presentations and events relevant and related to libraries. 7000 BC is pleased to return to Bubonicon — celebrating 50 years this year! — in the Dealers Room with independent comics from group members. It's Free Comic Book Day at the library! 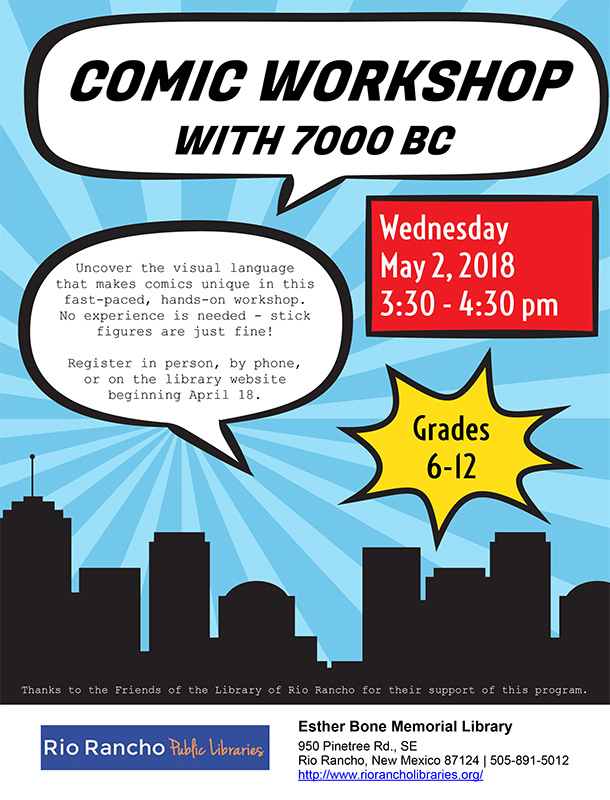 Celebrate at the Esther Bone Library in Rio Rancho where you'll find free comics, and this free comics workshop with 7000 BC. Uncover the visual language that makes comics unique in this fast-paced, hands-on workshop. No experience is needed — stick figures are just fine! This workshop is open to Grades 6-12. You must register to attend. Register in person, by phone, or on the Rio Rancho Library Website beginning April 18.